Do you wish to own a tool balancer? If so, we will assure you that, upon the purchase of a tool balancer, you will be thankful to have it. 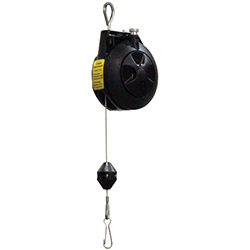 Tool balancers basically suspend large and heavy tools from a cable or a track. The process allows the worker to move the heavy tool out of the way when not required. However, the tool still remains within reach. Or, is it a hose reel that you are seeking to acquire? If you are looking to purchase machine balancers, industrial hose reels, cord and cable reels etc., we recommend products manufactured by Reelcraft. So, why should you choose Reelcraft Tool Balancers & Hose Reels? Well, Reelcraft is simply the leading global manufacturer of the widest range of cord, hose, and cable reels for commercial, industrial, and professional use. Most of the products manufactured by Reelcraft are durable beyond belief, and of the highest quality. In addition to that, the products are also easily accessible. However, the best part about Reelcraft products is the fact that they all come with warranties. As we mentioned earlier, Reelcraft boasts of over 2500 different models of hose, cord and cable reels for the heavy industry and automotive service etc. They also manufacture products for a wide range of OEM applications.The Reelcraft hose reels are well-capable of transferring a wide array of solution and substances such as transmission fluid, grease, antifreeze, welding gases, fertilizers, detergents, chemicals, solvents, air, diesel fuels, and water etc. Very few companies compare to Reelcraft when it comes to innovating new products for the markets. Most of the Reelcraft products benefit from the company´s lean manufacturing and six sigma procedures. They are engineered to perform better by design, are durable, and of the highest quality. Reelcraft features the most extensive line of cord, hose, and cable reels. Where can you purchase Reelcraft Tool Balancers & Hose Reels? You can easily get Reelcraft products from DBH distributors, Inc. In fact, DBH carries a wide range of Reelcraft product line. Basically, DBH distributors Inc. serves as a nation-wide supplier of nationally-known product lines such as Clippard, Monnier, Graco, Parker Brass, SPX Power Team, Reelcraft and many more. Since DBH distributors, Inc. is a certified Clippard Instruments dealer, you can purchase any part from them to keep your machines operating at optimum efficiency. Previously, DBH distributors primarily worked as a wholesale supplier and distributor of components until 2010. In addition to providing nationally-known products, DBH distributors Inc. also provides many industrial services such as hydraulic pump repair, plant maintenance, CNC millwork, bin stocking, welding, inventory control and fabrication. Hence, if you want a comprehensive list of Reelcraft tool balancers and hose reels, you should consider paying a visit to DBH distributors, Inc.